From the improv mastery of T.J. Jagodowski and David Pasquesi, to the diverse point of view from Indian-American creator Puja Mohindra, the Pilot Showcase is an amazing line-up of comedy, drama and inspiration. The pre-show Producers Panel (6:30p) will feature screenwriter Chris Parrish, whose TV credits include “The King of Queens” and “Curb Your Enthusiasm.” For the complete line up and ticket information. click here. The Midwest Independent Film Festival is a year-round movie event in Chicago that takes place the first Tuesday of every month, at the Landmark Century Centre Cinema. The festival has been recognized by Chicago Magazine in their “Best of Chicago” issue, and has become one of the top places for local filmmakers, producers and actors to network in the Windy City. 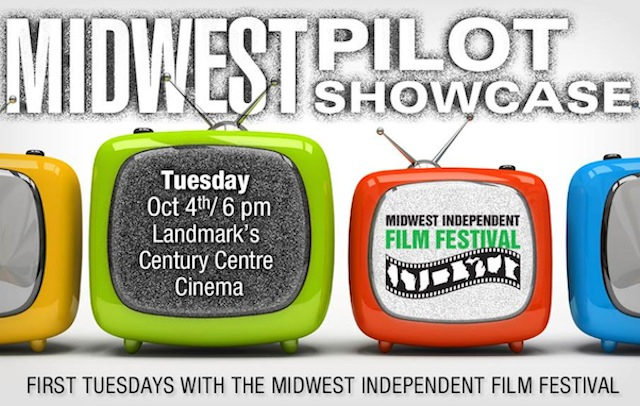 The Midwest Independent Film Festival Present the Midwest Pilot Showcase on Tuesday, October 4th, 2016, at the Landmark Century Centre Cinema, 2828 North Clark Street, Chicago. The Midwest Independent Film Festival screens on the First Tuesday every month until November, followed by their “Best of the Midwest” Awards in December. Click here for details about the festival.